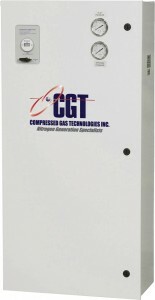 CGTPMNG "E" Series nitrogen generators use patented membrane technology to produce an uninterrrupted supply of gaseous nitrogen, on site. This compact system is ideally suited for low-flow applications that presently employ high-pressure gas cylinders or dewars of nitrogen. With Membrane Nitrogen Generators (PMNG), the inconvenience of gas cylinders and liquid dewars is eliminated. Nitrogen is generated at your location, continuously and reliably, requiring only a supply of compressed air. CGT INC. membrane technology works by filtering oxygen from a stream of compressed, dry air via hundreds of thousands of hollow, polymeric fibers - each about the diameter of a human hair - to produce gaseous nitrogen. The flow and purity of the nitrogen are at your control, assuring the perfect match to your nitrogen requirements. And, the automated Membrane Nitrogen Generators (PMNG) system virtually operates itself without requiring the attention of an operator. CLICK HERE TO SEE "HOW IT WORKS"
Membrane Nitrogen Generators (PMNG) information is also available in a printable format.